One knowledgeable companion was essential for the plan I worked out, which was to escape from a work party. There were six Polish airmen in Lamsdorf and one of them, Sgt. Joseph Krawiec, agreed to join me. Men for the work parties were detailed by a British sergeant–major P.O.W., and not by the Germans, so it was easy to have Joseph and I picked for a suitable work party. As Joseph was born and raised in Cracow, we selected a work party in the village of Bobrek. web page Germany Work Camps and web page Working Parties Lamsdorf: Stalag VIIIB 344 Prisoner of War Camp 1940 - 1945. This village of Bobrek was conveniently close – about 3km – to the pre–war Polish border. An escape from here would shorten our journey to Cracow where we hoped to contact the underground movement. It was harder to arrange an identity switch for Joe, as the guards kept a particularly close watch on the half dozen Poles. We delayed his exchange until the night before we were due to leave camp and the switch worked perfectly. The next morning we passed scrutiny at Lamsdorf gates without any difficulty. While we waited for our train at Lamsdorf Station, we met a Lamsdorf guard from the air force compound. Had he recognized us? As we were to soon find out, he had tentatively recognized Joseph as a Polish airman, and confirmed his suspicion once he returned to Lamsdorf. After this beating, the German NCO visited several POW billets and made it clear that the type of punishment just accorded to the airman who exchanged identities for the purpose of escaping was exactly what anyone else who tried similar could expect. When the New Zealander arrived at Lamsdorf it was soon discovered that the wrong person had been identified and returned to the main camp. My real identity remained undetected, but I was left without any contacts in Poland and only the faintest knowledge that Cracow was a good city to head for. 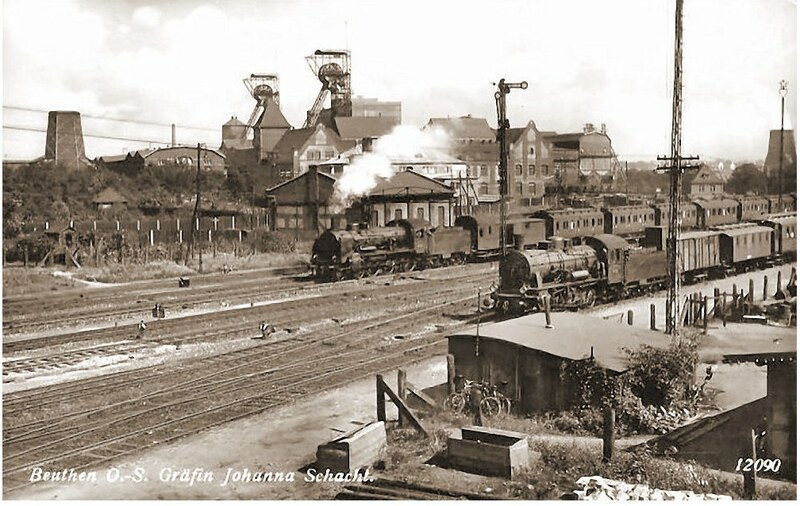 The prisoners at Bobrek worked in the coal mines and I soon found myself hewing coal eight hours a day in the biggest and deepest coal mine at Beuthen Silesia, the Johanna Shaft mine (EN: Probably should be "Gräfin Johanna Schacht mine"). I only stayed two weeks and then made a last minute arrangement with an Irish soldier named Private Cross to escape on Saturday night. I smuggled some pliers back from the mine in my coffee can. A tiny Union Jack, off the wrapper on a mustard tin, to identify ourselves when we reached Poland, was included in our escape kits. In preparation for escape, we had been saving up biscuits, chocolate, butter and cheese from Red Cross parcels. The camp in which we were billeted was surrounded by two barbed wire fences with flood lights at each of the four corners. The windows of our huts were also covered with barbed wire. There was only one gate with an armed guard on the gate and another guard who patrolled the perimeter between the two fences. We chose midnight 6th June 1942 for the break because the guards were then busy checking the night shift from the mines back into camp. As it was Saturday night most of the guards on duty were wishing they were in town drinking beer, and to help us still further a violent thunder storm started at 10 p.m. We clipped the barb wire over our windows according to plan, cut our way through the wire of the first fence at a point as far from the gate as possible and in the shadow. We jumped over the second 6–foot fence and ran down the embankment of the railway which ran past the camp. We were soaked and breathless, but regardless, the guards had not seen us. We followed the rail line for a short distance in a south– easterly direction. We then made our way across country to the main highway leading to Cracow. We made our way along the roads by night, sleeping during the day. We rationed our supply of food to 6 biscuits and butter or cheese and one small piece of chocolate per 24 hours. A week later, we reached the border of occupied Poland. Our journey had been uneventful and successful so far, but that night as we crawled along the course of a creek, often stumbling into the water in the darkness, we were both on edge. Several times we thought we saw border patrols and froze in our tracks. And we were too tense to laugh at our own stupidity when we discovered that the lights we thought were glowing cigarettes were only fireflies.